Recently I took the tour again: a bus took us to the outskirts of Eindhoven where a deserted and ran-down warehouse was hosting the graduation show of the Design Academy. 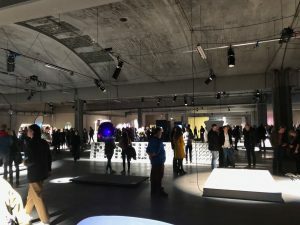 A dark, huge space filled with dramatically lit exhibits of student work and many, many people wandering around, observing the work with a mixture of interest, curiosity and disbelief. I was overwhelmed by the sheer size of the show: almost two hundred students were apparently graduating and showcasing their stuff. Two things immediately came to my mind: what the heck are they showing here and where the heck do these graduates want to pick up a job? A. An activity that is an articulation of a persons ability to be creative and express its personal view on what he or she can do to create artifacts at will? B. The outcome of a persons ability to do the above? C. A deliberate and considered adaptation of artifacts (or socio- or mentefacts) to change them in favor of a specific improved context of use with a user in mind? D. The outcome of C? My view is C. But what I was looking at was predominantly B, assuming that most of the graduates underwent A. 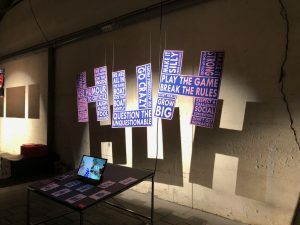 A couple of year ago Dutch design-theorist Timo de Rijk instigated a lively but rather localized debate about the definition of design and the approach taken at design schools, like the Eindhoven Design Academy. His verdict was clear: Design needs to have a user in mind and deliver what it promises. In a newspaper article in the Dutch newspaper NRC he heavily critiqued the design of a Design Academy graduate who conceived a mine-sweep solution, the Mine Kafon. A captivating sculptural device coming along with a promise that was heart warming and that earned the designer many awards: the design was even exhibited at the Moma. As much as I understand that at a design school certain skills have to be trained and that therefore students work on artifacts that are not strictly user centered, still, their final work piece should connect to the application of design, and not be only a form of skill training. Showcasing concepts that project skill rather then relevance are interesting from an educators’ and scholars’ perspective, but these also tell something to the outer world, like: „look how skillful I am, I can just go crazy!“ It leaves those who want to pick up the skill and do something with it rather puzzled. This notion of design, where the designer is at the center and not the user, is painting a picture of the designer as an artist, which is hard to get out your head: it communicates design as a form of art. This is bad. Bad for all those who want to grow design as a discipline within organizations with a role to articulate the essence and purpose of what that organization delivers in an appropriate, relevant way. If design is conceived as an art form, it will remain something outside the regular, something special. Design is nothing special, it’s the normal! Every time I engage with business people and help them to get a grip on what they can do with design in their organization, I have to clarify what design actually is. Turns out that they already know, but rather as a gut-feeling: what design can actually do for them is continuously blurred by all those impressions of so-called designers that ‚just go crazy‘! Every organization needs design to articulate the purpose of what it is in business for, they need design that delivers what they promis. They need designers that understand this and that are skilled to support in that. Design is something any organization is doing, either conscious or not, and it is not something exclusively done by designers! It just needs professionally trained designers to get the best out of an organizations’ effort in design. So they need designers that can ‚play along the tune‘ set out by the organization and are not creating their own piece of music. This doesn’t mean they become robots in execution mode, but highly sensitive professionals who can challenge and develop the organization they work for, applying their skill-set to get the best out of the collective undertaking. That’s a tough job to do, way more difficult than to come up with you own ‘stuff’. I left the exhibit with the hope that amongst all these designers some might have the ability to pick up a job in an organization and work on design for the better. All the others have the opportunity to just ‚go crazy‘!